Disney has decided to take all their animations and turn them into live action. The problem is some of them don’t lend themselves to that environment and that’s exactly the case with Dumbo. Dumbo revolves around an elephant with wing-like ears and his goal to reunite with his mother. Now let’s talk about the elephant in the room, Dumbo isn’t good, and it hurts because it’s barely watchable. The only positive about it is the acting from Danny Devito (who shines as America’s sweetheart) and the CGI version of Dumbo. There’s something about the way this elephant is animated and interacts with people that makes it likeable. It all falls apart, however, when another character speaks to it, showing how wooden and dull the dialogue is. Jon Favro proved that a full CGI Disney remake can be amazing, so how Tim Burton fumbled the ball so bad will always evade me. In all fairness, this critic has never seen the original Dumbo, but if a film can’t stand on its own without the love of the original pushing an audience member forward, it shows that the film has problems and this movie is a prime example. One of the main issues that bring itself to the front right out the gate is the child actors. Even if they were trying their best, it doesn’t excuse the way they were poorly written, being used either as a failed platform or as extras. Claiming things as passions and having that portrait characterization is as disrespectful as flat-out having them wear a sign stating, “This is what makes me important.” It treats the viewer as stupid, and I’m aware this is a kid’s movie but if it has $170 million backing it, it could spare a few dollars for a decent writer. There are some fantastic visuals, and that does shine through though. From the style of the setting to some of the set pieces, the show carries a very distinct identity that people can appreciate. But style can’t hold a movie up, it needs to have features that complement its style, and that isn’t present in this remake. 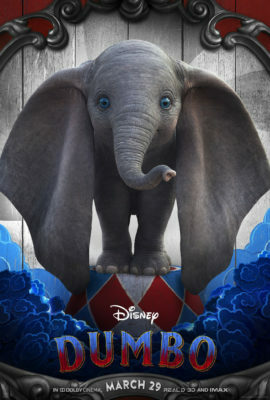 Dumbo is a film that no one asked to be remade, and now that it exists, it’s clear that it’ll become so dull that. In a few months or at the most a year, no one will remember it anyway.